An undated photo showing veterans assembling wreaths and poppies in Montreal. Blasts from artillery and mines during the First World War churned up the earth so much that none of the usual mix of crops and vegetation had a chance to grow. Yet out of that turmoil a determined wildflower, the poppy, began to flourish. Its colour reminded soldiers of the blood lost on that very ground, and inspired Canadian John McCrae to write his famous poem, In Flanders Fields. That poem, in turn, became the inspiration for The Royal Canadian Legion poppy campaign as we know it today. Each year in the two weeks leading up to Remembrance Day, some 19 million poppies are distributed across Canada. The lapel poppy features a red piece of moulded plastic covered with flocking (a velvet-like material). A pin through its black centre, helps attach it to clothing. The original design of the poppy featured the black centre but in 1980 the centre’s colour was changed to green. The centre went back to black in 2002 to reflect the colours of the poppies in Flanders. 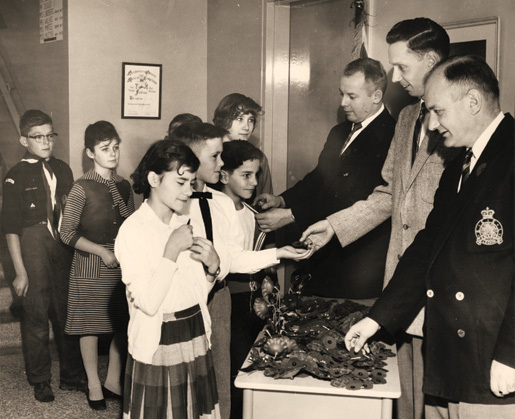 Legionnaires, in what was then Fort William, Ont., distribute poppies to schoolchildren in 1960. As always, poppies are distributed freely. A donation to the annual campaign is strictly a personal choice. The money raised helps those who have served or who now find themselves in need. The campaign is often seen as “aid for the living from the dead.” In 2007, $16.4 million was raised. While the author of In Flanders Fields was a Canadian, the origins of the poppy campaign can be traced back to France and the United States. In November 1918, Moina Michael, who was working at the YMCA Overseas War Secretaries headquarters in New York, was inspired by McCrae’s poem and purchased silk poppies to be worn on the anniversary of the Armistice. She would go on to promote the wearing of poppies on each Armistice Day. Two years later, Anna E. Guerin of France was visiting the U.S. on a mission to raise funds for orphans. She saw a chance to apply the wearing of a poppy to a campaign that would raise funds for those who had been disadvantaged by war. She returned to France and approached wounded veterans and soon these men were busy making poppies for distribution, in exchange for a donation. 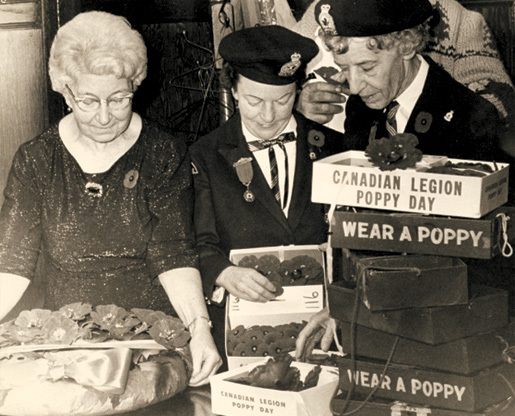 Members of the Peterborough, Ont., Ladies Auxiliary distribute poppies during the early 1970s. She took the idea to Britain where Field Marshal Earl Haig was quick to see the advantage of employing wounded soldiers to manufacture the lapel poppy. He also encouraged the British Legion to mark its first poppy campaign in 1921 with poppies purchased in France. That same year, Guerin came to Port Arthur, Ont., now part of Thunder Bay, to attend the convention of the Great War Veterans Association, the largest of the veterans groups which would later form the Canadian Legion. “The G.W.V.A. readily accepted the suggestion that the poppy be worn on the anniversary of Armistice Day and, on Nov. 11, 1921, poppies made by the women and children of France were distributed in Canada for the first time under the sponsorship of the G.W.V.A,” wrote Clifford Bowering in Service, a history of The Royal Canadian Legion published in 1960. In 1922, the federal Department of Soldiers’ Civil Re-Establishment came to an arrangement with Vetcraft Industries Inc. to produce the poppies for the 1922 poppy campaign. Vetcraft employed disabled war veterans to manufacture various crafts. The poppy campaign would have three objectives: to be a visible sign of remembrance; to raise money for needy veterans and to provide employment to disabled veterans. “Most appropriately, in Canada the manufacture of the silken replicas is gradually being concentrated in the hands of men who were broken by the conflict. Men who are unemployable in the exacting processes of ordinary commerce find in the manufacture of these little flowers a sacred and congenial task. Their fingers may not be nimble and their day’s output may be modest but they put into the results a significance that the rapid processes of commercial manufacture cannot possibly encompass,” wrote the Legionary, forerunner to Legion Magazine. 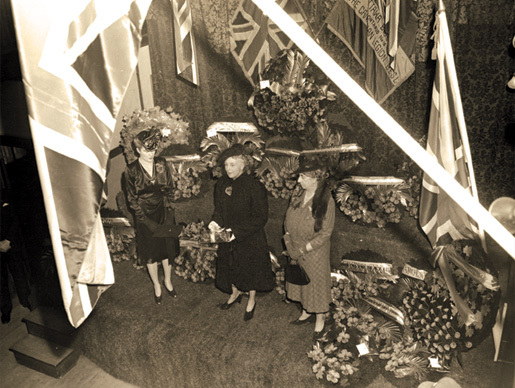 Princess Alice (centre), wife of Canadian Governor General, the Earl of Athlone, launches the annual Poppy Day campaign during the Second World War. In 1925, Canada hosted a conference of the British Empire Services League in Ottawa at which it was decided that the poppy would be adopted as the universal emblem of remembrance throughout the British Empire. The poppies continued to be made by Vetcraft Industries Ltd. until 1996 when Veterans Affairs Canada decided that it could no longer continue supporting the company. The Legion then took over responsibility for the manufacture of poppies and wreaths and contracted a private company in Toronto. 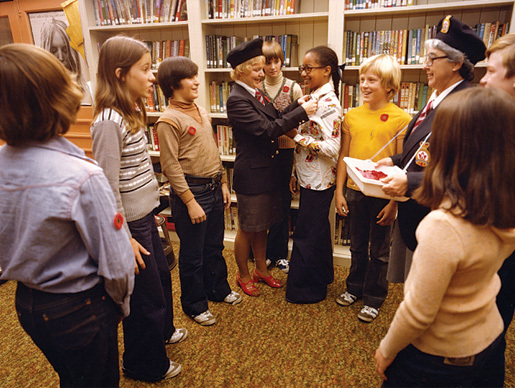 Members of the Ladies Auxiliary visit a school during the poppy campaign in the mid-1970s. A common frustration with the lapel poppy is that they tend to fall off or be knocked off by seat belts and other obstacles. Recently Dominion Command introduced stick-on poppies which don’t require a pin, but these are distributed to residents in long-term care facilities where pins could present a danger. They have proved very popular. I have one of the old style, with the green and black center. Can anyone shed further light more than range of 1922 until 1970’s ? Thanks and God Bless. I’ve had it in my family for at least 50 years. Thank you for your comment. The poppies were made by Vetcraft Industries which the Government of Canada set up to give employment to disabled veterans and others. When the government phased out Vetcraft, The Royal Canadian Legion took over the production of poppies and the centre returned to the original black. families, allowing them to take an active part in maintaining the tradition of Remembrance. 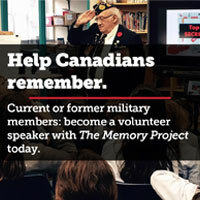 When it no longer became practical for Veterans Affairs Canada to maintain the “Vetcraft” operations, the Legion volunteered to take on the continuing responsibility for the production of Poppies. In so doing, Dominion Command has awarded a production contract to a Canadian company to produce the Poppies. All operations are conducted under strict Legion control and oversight. The Center was changed to one single colour – green – in 1980 but then change to one single colour – black – in 2002.